PSP - Game or Brick ? The extremely popular PlayStation Portable game device has become the latest target of malicious software writers, with the discovery of a "Trojan horse" program that renders the machines inoperable. PSP is specially designed to run only approved programs and games but unauthorised codes or patches can be downloaded to bypass these restrictions.The newly discovered malicious software, or "malware", poses as just such an illicit patch. The problem is that, once installed, it deletes four critical system files, rendering the infected device useless. Researchers at antivirus firm Symantec say the Trojan, dubbed Trojan.PSPBrick, was found circulating on gaming web sites last week. 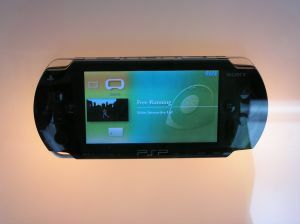 PSP users who unwittingly install it will see the message "Your PSP 2.0 is hacked, please reboot" pop up on the screen of their console. However, efforts to restart the gadget are likely to end in frustration. "It's a really nasty trick," says Mikko Hyppönen, director of antivirus research at Finnish company F-Secure. He believes there is no way to remedy an infected machine without taking it for costly repairs. "A hacker as destructive as this obviously isn't thinking straight." So basically once this malicious software has been installed you've got yourself an extremely expensive "brick" which could be used to build your dream house! The above article has been a product of aikonn.